Research Articles: are considered for publication if they describe significant, new and carefully confirmed findings supported with adequate experimental details. Title page: a) title, b) short running title (limit: 8 words), c) name of the author (no titles or academic grades) and address of the institute(s), d) complete mailing address of corresponding author including telephone and telefax numbers and e-mail addresses. Page 2: a) an abstract containing not more than 250 words with no abbreviations, b) keywords (limit: 8 words). Next pages: a) introduction also indicating the aim of the study, b) materials and methods, c) results (double presentation of data in the form of text, tables or ?gures should be avoided), d) discussion, e) acknowledgements f) list of references, g) legends of tables and ?gures. •	Journal Articles: Itoh M, Okugawa T, Shiratori N, Ohashi H: Treatment with triiodothyronine (T3) against multinodular goiter fails to prevent the onset of Graves disease. Endocrine Regul 29, 151-156, 1995. •	Book Chapters: Mornex R, Orgiazzi JJ: Hyperthyroidism. In: The Thyroid Gland (Ed. M de Visscher), pp. 279-362, Raven Press, New York 1980. •	Books: Podoba J: Endemic goiter in Slovakia. VEDA, Bratislava, 1962. When your electronic artwork is finalised, save it as or convert the images into JPG or TIFF formats. For color or grayscale photographs (halftones): always use a minimum of 300 dpi. Each illustration should have a caption. Captions should be supplied separately. Keep the text of the illustrations in a minimum description and explain all symbols and abbreviations used. The tables should be numbered consecutively in accordance with their appearance in the text. The data presented in tables should not be duplicated in the results or described elsewhere in the article. Case Reports: are considered for publication if they describe new and carefully confirmed clinical findings. The manuscript preparation should follow the Instructions for Research articles outline with the following alterations: Methods, Results and Discussion can be written as a one section. Short Communications: are manuscripts containing new clinical and experimental data of smaller scope. They should not exceed 3 printed pages and may include 1 table and 1 ?gure. The list of references at the end of the paper should not exceed 10 citations. The manuscript preparation should follow the Instructions for Research articles outline with the following alterations: a) no keywords and b) Methods, Resutls and Discussion can be written as a one section. Review Articles: should cover a specific topic of endocrinology. They do not only to be exhaustive reviews, but also shorter articles intended either to draw attention to developments in a specific field or to bring observations over a wide area which seems to point in a new direction. Special Issues: The journal welcomes proposals for special issues on topics that fall within the scope of the journal. The proposal should identify prospective papers and authors and give an indication of the time-scale in which the special issue could be produced. Submission to Endocrine Regulations uses electronic manuscript submission. Follow the link to Editorial Manager (http://www.editorialmanager.com/erueesavbask). 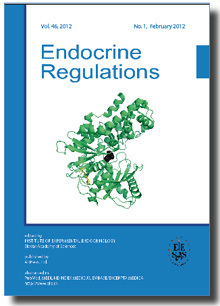 If this is your first submission to Endocrine Regulations, click on "Register Now" to create an author account. If you already have an account, enter your username and password to submit a new or revised manuscript. If you forget your password, do not create a new author account. Please, contact the Editor in Chief by E-mail for assistance. The manuscript should be written in a correct English language (American or British usage is accepted, but not a mixture of these). We greatly appreciate the time and effort given by reviewers in evaluating papers for publication in our journal. Research articles and communications are reviewed by a minimum of two reviewers, review papers by at least three. While preparing the reports, the Referees are asked to follow the reviewer questionary which is available in the Editorial Manager system for Endocrine Regulations. Reviewers are kindly requested to deliver their final reports in the assigned time.